The candid, poignant, unforgettable writing of the young girl whose own life story has become an everlasting source of courage and inspiration.Hiding from the Nazis in the “Secret Annex” of an old office building in Amsterdam, a thirteen-year-old girl named Anne Frank became a writer. The now famous diary of her private life and thoughts reveals only part of Anne’s story, however. 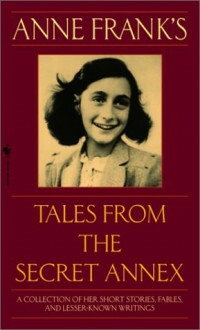 This book rounds out the portrait of this remarkable and talented young author.Newly translated, complete, and restored to the original order in which Anne herself wrote them in her notebook, Tales from the Secret Annex is a collection of Anne Frank’s lesser-known writings: short stories, fables, personal reminiscences, and an unfinished novel, Cady’s Life.